Traveling back and forth in time is seldom easy and often carries risks. I braved the odds and have thoughts to share about this new metroidvania. 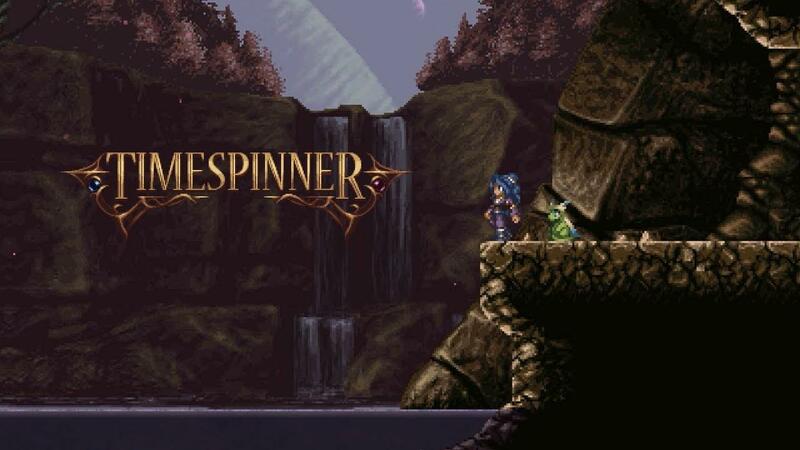 Timespinner [Official Site] places the player in control of Lunais, a young girl belonging to a nomadic clan that guard the titular Timespinner device. This device allows time travel and, as you might have guessed, a powerful empire takes interest in gaining control over it. The clan has been slowly fighting a war of attrition by sending its own members back in time to warn whenever the empire gets too close. Things get very messy very quickly for young Lunais and she sees her own mother killed by the emperor and the Timespinner destroyed. Transported to the imperial home world, she swears revenge and looks for a way to undo the the destruction. 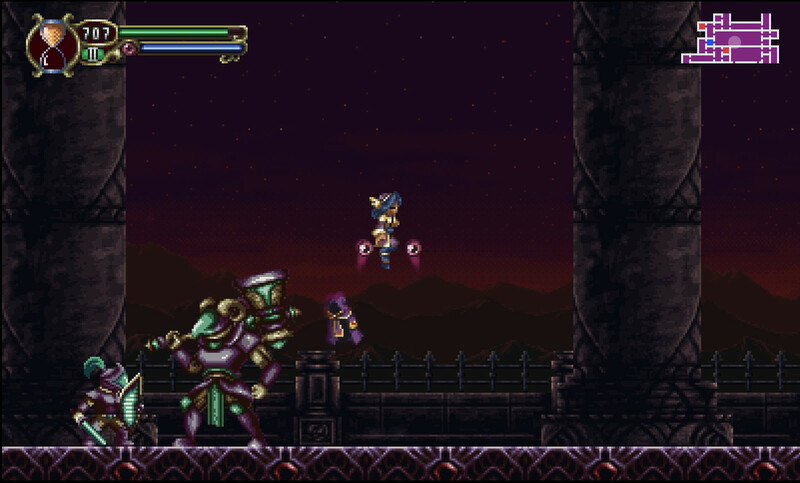 In order to get her revenge, players indulge in very classic metroidvania action. Expect a large map to explore, backtracking and the gradual unlocking of abilities and areas. Lunais can find and equip new pieces of equipment, get new attack types and level up as you might expect. Weapons consist of different types of orbs that you can equip and level up and swap between quickly—in effect meaning that you can play the game with the attack type that you most like or feel is appropriate for an area without any one orb feeling intrinsically better than the other. 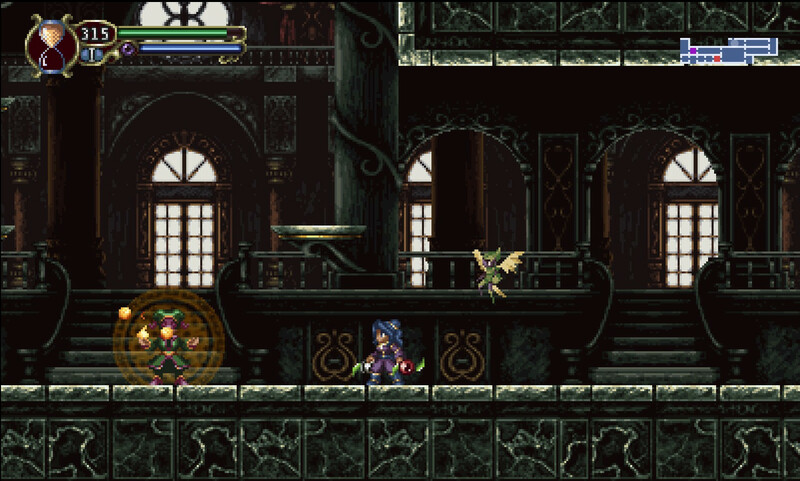 Otherwise, mechanically, Timespinner borrows from many other games of the genre. There are things like optional quests, fast travel points, upgrades and accessories galore. It doesn’t push any envelopes when it comes to innovation but that’s fine for the most part. The metroidvania formula doesn’t really lend itself to too much experimentation in the first place. I was impressed by the attention to detail and the overall polish of the game. It’s definitely a case of the whole being more than the sum of its parts. I enjoyed the story and how it tied into the events going on in both past and present. Though there’s predictable twists and outcomes, the story that’s told nonetheless is successful at illustrating that there’s few things in life that are completely black and white. There are a few excesses here and there and at times some of the writing can feel a little too self-indulgent, particularly regarding the characterization of the supporting cast. I’m not really going to go into spoilers but I would have preferred a little more variety in the outcomes of the secondary story threads and character progressions. Things also did get a little too muddled when it came to the setting and plot; elements like demons and gods don’t really feel very congruous with the rest of the sci-fi vibe. Demons, particularly, are shown to be a large factor in the discord between the sister planets but their presence doesn’t ever really feel resolved despite what characters say and the choices made towards the end. This isn’t the only thing that’s left in the air as it’s also difficult to care about some of the antagonists and bosses along the way. Even if they do have dialog or a motivation, they’re introduced and dispatched in no time flat. Seeing as how the main character acquires a more nuanced worldview as the plot goes on, this makes some of that growth lose some of its poignancy. I’ll freely admit I’m a sucker for well-done retro looks and sounds and, on that front, Timespinner delivers. Everything from the environments to enemies and animations look fantastic. It’s a treat to explore a new area just to see what kind of enemies it’ll have. Not to mention that finding changes in the present after making changes in the past is cleverly done. Likewise, the music is another strong point with the score matching up the mood and action of the game superbly. With all of that said, there are a few nitpicks I have to make. For starters, I felt that too many enemies were recycled between past and future parts. The intent there is clearly continuity between the areas in different time periods but I would have liked to have seen newer and more interesting designs instead of (usually) tougher variants. More importantly, I found the game to be a little on the easy side and would have liked it if some of the normal enemies had put up more of a fight. Your mileage may vary according to your skills and, to its credit, the game does have higher difficulty modes that are unlocked. While the game with its past and future maps is sizeable and takes a while to fully explore, I was still left hungry for a little more content. This may be due in part to the optional quest system. It could have used more missions and more variety in them—it’s easy to breeze through them one after the other. With the comprehensive warp system there’s just very little reason to revisit some parts of the map and it would have been nice to be able to discover more new things in these areas in true metroidvania fashion. Failing that, I think that having another side area in either past or future, one that doesn’t really have an equivalent area in the other time, may have produced a slightly more well-rounded experience. Recent games like Hollow Knight or even the more roguelite Dead Cells have spoiled me and raised my expectations in that regard. All my complaints are relatively minor when contrasted with the positives. The action and pacing feels right, the controls are responsive, the story beats are steady and it doesn’t feel like a slog to reach the ending. It took me around six or so hours to see most of the game and get a couple of endings. 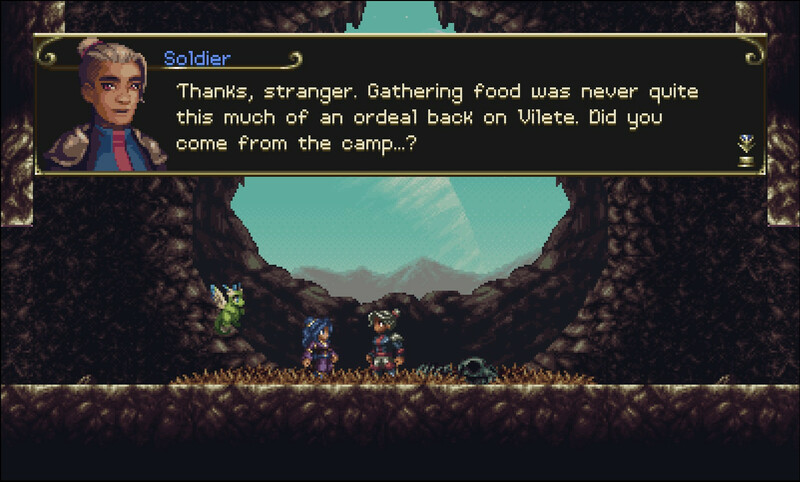 I enjoyed most moments of that ride and, so, Timespinner gets a clear and strong recommendation for lovers of metroidvanias. It may not reinvent the wheel but it didn’t have to—it’s a slick and engaging experience that’s worth checking out. You can get Timespinner on Steam or the Humble Store. I hope this makes it to GOG since Chucklefish is the publisher, my love for metroidvanias make this an instabuy. Avehicle7887 I hope this makes it to GOG since Chucklefish is the publisher, my love for metroidvanias make this an instabuy. I spoke to the dev before release and he said he had submitted it to GOG. But GOG's process often isn't exactly expedient, consistent or very transparent, so no clue if it'll make it there. The Humble Store link in the article does include DRM-free builds though. Thanks for the review, BTRE! Quote It doesn’t push any envelopes when it comes to innovation but that’s fine for the most part. But that’s fine. You have a little redundant edit there. Quote The metroidvania formula doesn’t really lend itself to too much experimentation in the first place. I love a good traditional metroidvania, but I would have to argue that a number of recent games experiment quite a bit. Quote Timespinner gets a clear and strong recommendation for lovers of metroidvanias. no_information_here Thanks for the review, BTRE! Quote I love a good traditional metroidvania, but I would have to argue that a number of recent games experiment quite a bit. That paragraph was talking about mechanics. There's little twists here and there in some games (like in this game you can stop time for limited durations) but I can't really recall anything very innovative in recent years save for the hit and miss infusion of "rogue" elements into gameplay sometimes. I mean, I'm not really criticizing the genre for that, they hit on an excellent formula early on so it's wise not to stray too much. BTRE The Humble Store link in the article does include DRM-free builds though. Quote Timespinner is provided via Steam key for Windows, Mac, and Linux. For key redemption, a free Steam account is required. It's pretty much a one-man project, so I imagine dealing with a lot of launch issues isn't easy but the dev hasn't forgotten about it. Sadly, I bought it on Humble and realized I could not download the DRM free version. Only the Steam one. I opened a bug at Humble (Request #1246699) and for now they removed the labels advertising the game as DRM-free. Hope it will be back soon. I binged it today, great fun! I think it was too easy though... I'll try nightmare mode someday. OK, the DRM-free version is now available on Humble. Yeah !